In financial markets there are many different types of traders, both human and algorithmic. They are often categorized by their trading time-frame. Alternatively it is possible to categorize based on what kind of strategies they apply. In general there is one main distinctions to make. There is a difference between technical and fundamental trading. Fundamental trading includes factors outside the price of the security; typically a company’s accounts is used. Technical trading however is only based on the actual price development and its qualities. Technical traders base their strategy on the assumption that historical price data can in some way predict future prices. The degrees to which analysis one employs affect the time-frame, since fundamental analysis is inherently much more static than technical. Price update occur several times per second, while the company results are only published once a quarter. Fundamental data is also more qualitative and thus harder to analyze quickly, e.g., news. Analysis of technical data is purely quantitative, and can thus be readily handled by computers. Generally, the shorter time-frame, the more automated the traders are. The longest time-frame is often called position trading. It generally consists of all positions held longer than a few months. This is a very reputable strategy, recommended by Warren Buffet himself, but with a limited possibility of return. Since one has plenty of time to do a thorough analysis of the asset, algorithmic methods have less advantage here, but can be used as supplementary guidance. This category also includes more active investors, who are active in a different sense than earlier described. They take an active part in management of the company they’re invested in, like private equity companies. Positions held over days or weeks include strategies like swing trading and more short-term fundamental analysis strategies. This is generally the shortest time-frame one finds purely fundamental analysis traders. Changes in price on a lower scale than days are often considered noise to these traders. There is some technical analysis done over several days, but it is limited. This is because the primary goal of pure technical analysts is to speculate on price swings. A shorter time frame will give more than enough volatility to do this, due to the fractal nature of the stock market. A fractal is a mathematical concept where roughness exist at whatever resolution you look at. The graph of price a different time periods will tend to have roughly the same kind of volatility. Intraday trading is trading confined to a single day, most day-traders sell their positions before close. This is mainly speculation and mostly done by technical analysis, though one might supplement with fundamental techniques. Day trading can be a job for human investors, but require much time and is quite close to a zero sum game due to the lack of the long term equity premium. 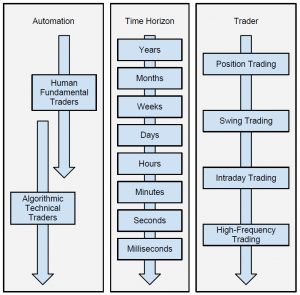 Intraday trading is becoming the realm of machines as they can search through much more data. Most machines are however trading on more or less instant strategies where the aim is to hold an actual position as short as possible; these are called High-frequency traders. High-frequency trading (HFT) is a poorly defined term. In this paper it is used in its semantic meaning of all trading done at a high frequency instead of meddling with all the contradictory definitions in the literature. With this meaning of the term, HFT will be a broad concept that includes all trading where the trading speed is used as a competitive advantage. In 2010 these systems trade on milli- and microseconds. 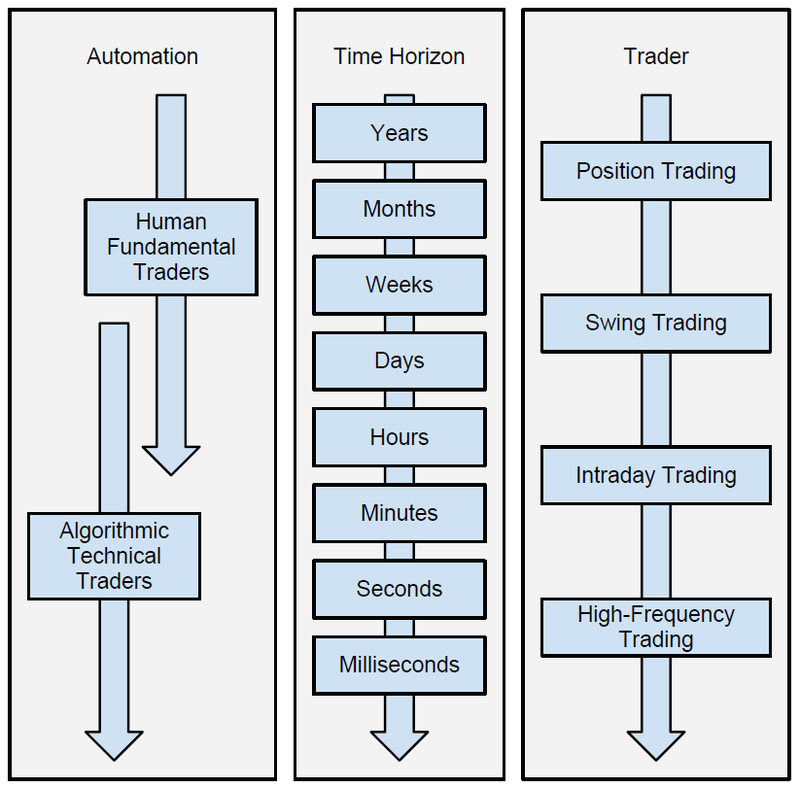 All HFT is done by algorithms, as the speeds required for this trading type are beyond human capabilities. Low-latency trading is a subclass of HFT, and can be thought of as a specific strategy of HFT. These are a naive set of simple algorithms which sole advantage is their ultra-low latency, direct market access. An example of a low-latency strategy is to survey the news. The instance good news hits the market, a low-latency trader will buy from slower sellers which have not had time to increase their bid price, and then sell to a new higher price. Most of these tactics revolve around quickly finding and exploiting arbitrage possibilities. There is tough competition in having the fastest algorithms and the lowest latency. This activity is very capital intensive due to the hardware requirements and it needs a certain initial capital. There are few amateurs in this area and most actors are large banks, funds or even specialized algorithmic trading firms.